UNITED NATIONS, January 21 -- While UN Secretary General Ban Ki-moon runs for a second term claiming transparency and good government, he is represented by a spokesman who on Friday refused to answer questions after being asked about the applicability of a UN rule. The only interchange earlier in the briefing had Inner City Press asking how UN Staff Regulation 1.2, prohibiting staff from public statements underlying impartiality applied to UN official (and Ban Ki-moon favorite) Michelle Montas going on CNN to say she would sue Baby Doc Duvalier. The previous day, Inner City Press has asked Nesirky what rule applied to Montas' actions. Nesirky did not provide any rule then, nor the next day. But Inner City Press was approached by outraged UN staff, who called Nesirky “the worst spokesperson the UN has ever had,” and provided the applicable rule. They also provided a precedent from last decade, when Doctor Andrew Thompson was fired under this rule for making public UN peacekeepers' sexual abuse of those they were charged to protect. On January 21, Inner City Press asked Nesirky about the rule, and intended to ask about the Thompson precedent. But Nesirky said, “I don't want to talk about it further.” Video here, from Minute 18:30. Earlier in the briefing, Inner City Press had asked why the UN has said nothing about Sudan's Omar al Bashir's government blocking the printing of a newspaper directed at Southern Sudan, after they published articles about the secession referendum. Video here from Minute 16. After the UN Rules question, despite having said he would take Inner City Press' question about Ban Ki-moon's humanitarian coordinator for Sudan Georg Charpentier's claims that the thousands of violent deaths in Darfur in the last 12 months were not the al Bashir government's fault, Nesirky refused to take the question. A spokesperson is paid to answer questions. It is particularly strange that the spokesperson for a Secretary General claiming transparency and good government would simply refuse to answer about the applicability of a rule to a public UN action. To then retaliate against the media asking the question about rule and refuse to take any question, including about a UN mission for which the UN charges its member states $1 billion a year is outrageous. But in Ban Ki-moon's UN, will a UN official who on camera refuses to do his job, explicitly retaliating against a question about Ban administration lawlessness suffer any consequences? Other organizations would fire such an individual, including it seems the UN-affiliated International Monetary Fund. Inner City Press currently also covers the IMF, for example getting three questions answered on January 20 with no acrimony, retaliation or lack of professionalism. But in Ban's UN, officials like Nesirky are permitted lawless behavior that would not be allowed anywhere else. Already, Nesirky has publicly yelled at Inner City Press, “It is my briefing! I run it how I chose!” For the week at the end of 2010, for which he was being paid, Nesirky left question after question unanswered. Earlier this month, Inner City Press asked Nesirky for Ban's response to a New York Times article about bloat, overlap and waste in Ban's UN. Nesirky replied that since Ban was holding a press conference on January 14, Inner City Press could ask him then. But Nesirky did not allow Inner City Press to ask any question on January 14. Afterward, Inner City Press assessed the lack of transparency in Ban's UN for Swedish television, here. Most recently, Nesirky said he would get an answer about Ban's staff's involvement in war crimes described in the New Yorker magazine - but has not provided any answers. Many UN correspondents have said he should not remain in the job. And yet he does, representing Ban Ki-moon and a UN that is, particularly on this front, in dramatic decay. Watch this site. UNITED NATIONS, January 14 -- With expectations he'd confirm he'll seek a second term, UN Secretary General Ban Ki-moon held a press conference in New York on Friday. He began by focusing on three issue, not mentioning the critiques of the UN on any of them. Ban mentioned Haiti, but not the allegation that UN peacekeepers brought cholera to the island and then covered it up. 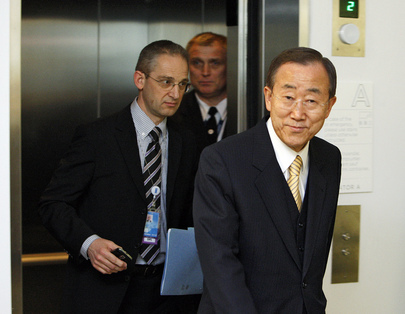 He has been asked to remove the UN immunity of a UN staffer there for a murder inquiry, but his spokesman Martin Nesirky has refused to address Ban Ki-moon's response. Ban mentioned Sudan and Darfur, but did not address the the UN Mission there this week provided free transportation and logistics help to an indicted war criminal, Ahmed Haroun. What was that about accountability? After these three points, Ban's spokesman Martin Nesirky presided over a question period in which issues like the Middle East, North Korea and Ban's own statements a month ago about his Panel of Experts being able to do work in Sri Lanka were not present or allowed. As the frustration against Ban and Nesirky grew in the room, some journalists started shouting out questions. One question was about the corruption and lack of transparency in the Ban administration alleged by former top UN investigator Inga Britt Ahlenius. Ban, reading from notes, claimed that 99% of his officials now make public financial disclosure on the UN's web site. This figure is not true. Many officials simply file a one page form that they refuse to make any disclosure public. Other Ban envoys, such as Alexander Downer who simultaneously works for a business consultancy Bespoke Approach, don't make financial disclosures. Ban's expert on genocide Francis Deng is allowed, on UN time, to work on private book projects. He owns property, allegedly in the Sudanese region impacted by the referenda and stalled popular consultations. But his “public financial disclosure” doesn't even state what state of Sudan his property is in, nor how much it is worth. On UN time Deng writes books about Sudan and the referendum, but the UN refuses to say that the contents are attributable to the UN. Questions pend for weeks in Ban's Spokesperson's Office. Spokesman Martin Nesirky says proudly that that are questions that he simply will never answer, without even explaining why. This is not transparency.